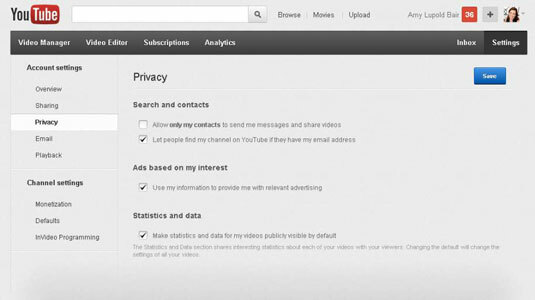 One of the main reasons to create a YouTube channel is to gain access to customized settings, which determine the privacy level of your profile information and your channel’s content. These settings not only affect any videos uploaded by your teen to the account, but also affect the video searches conducted via that account. This provides you with the opportunity to filter what your children see when watching YouTube. You can change your YouTube channel settings to edit what personal information about the channel’s content provider appears to the public when videos uploaded by that account are viewed. You can use this setting to keep the public from knowing that a channel is owned by a teenager, for example. By default, the age of the account holder appears on the channel while video posted on that channel is viewed. In fact, other YouTube users can see the age of an account holder even before that account holder has uploaded content. Click the down arrow next to your account name (upper right) and then click the my Channel link below the YouTube heading. On the profile page that appears, click the Edit button to the right of your username. 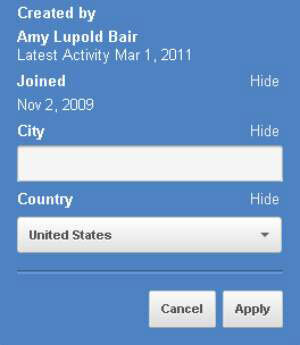 Under the Created By section, you can hide specific account holder information by clicking the Hide link next to that information. After you update your channel’s profile information, click Apply to accept the changes (or click Cancel if you change your mind). 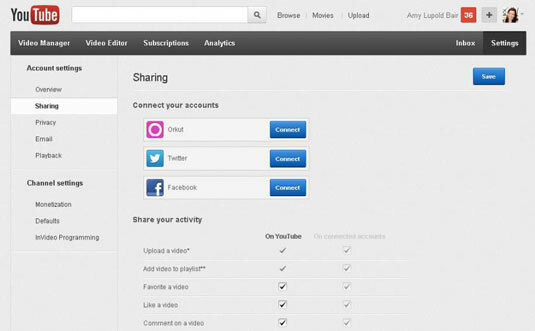 YouTube account holders can connect their YouTube account to their Orkut, Facebook, and Twitter social media accounts. If you choose to connect your YouTube account to a social media site, updates regarding your YouTube activity are sent automatically to the social network. You will likely want to customize these settings to maintain privacy. If, on the other hand, you want to share your YouTube activity with social media contacts, these settings may provide useful to you. Click the down arrow next to your account name (upper right) and then click the YouTube Settings link below the YouTube heading. On the Account Settings page that appears, select Sharing in the left sidebar. 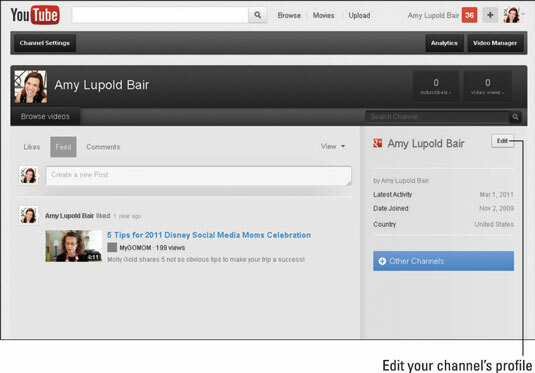 Click the Connect button next to the social media account you want linked to your YouTube account. In the Share Your Activity section, select how YouTube shares your YouTube actions on YouTube and your connected accounts (such as Orkut, Twitter, and Facebook). Select the check boxes for the actions you want to share. Such actions include uploading a video, adding a video to a playlist, marking a video as a favorite, liking a video, commenting on a video, and subscribing to a channel. Some actions are selected by default already; deselect those actions that you don’t want to share via YouTube or a connected social media site. After you finish your selections, click Save. When helping your teens select these settings, discuss factors such as how frequently they take each action on their YouTube account and how they use the other social media platforms. Will they be sharing YouTube actions with an audience of friends and family who may feel inundated by frequent updates? Is the YouTube account your child’s account, but the Facebook account is for the entire family? Like other social networking sites, YouTube allows users to connect to other users through features such as comments and private messages. 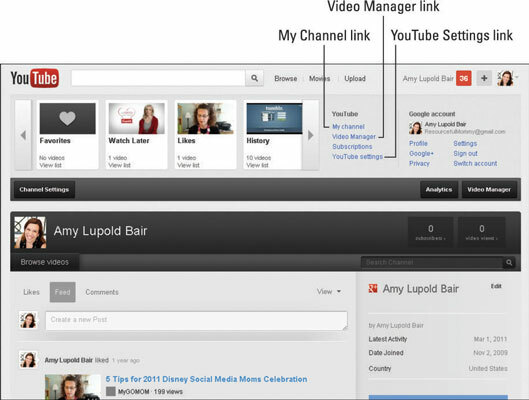 You may wish to create a YouTube account for your family or children to access personalization settings. You may not, however, wish to be contacted by the public through your YouTube account. YouTube privacy settings allow you to decide not only how the public interacts with your account, but also how YouTube itself accesses and shares your account information. On the Account Settings page that appears, select Privacy in the left sidebar. Search and Contacts: Set whether contacts can send you messages and share videos and whether people can find your channel if they have your e-mail address. Ads Based on my Interest: Elect whether YouTube can use your information to send you ads that Google believes relevant to your interests. Statistics and Data: Decide whether YouTube can share statistics and data about your videos publicly. For example, do you want the public to be able to see how many people have viewed your videos? Do you want the public to see the comments on your videos?